The Healing is Always Christ: In Israel the Good LORD Has Seven Times Increased Spectacularly Its Readership (Page Views) & A Salvation Prayer & A Pertinent Update! Our Lord Almighty is a Wonder-Working God! He is the only One Who could make these occurrences happen for a three-year period this coming June. My blog, The Healing is Always Christ, is four and one-half years old. One day in the spring of 2014 in looking over the countries and postings, within the statistics of this blog, I said to God, "Could we have a few more page views from Israel, LORD? Also, I would love to see more in Africa and South America." These requests were earnest and heartfelt to my Savior. God listened, and He did respond. Within a month or two of my prayer for more specific page views, I was looking to see what was happening- which countries, which postings, and how many. What I saw stunned and overwhelmed me...There it was- 417 views during a one-day period- and more, during a 2-3 hour time period! This number I had never seen prior for one day from all countries, let alone that many from one country, Israel! A quite rare day for any one country, usually the U.S., but possibly a European nation, China, or Russia, would be 80-115 page views. God had worked to the good for people in Israel, on a Sabbath, within 2-3 hours' time. These seven extremely unusual times are that because: no other country has ever come even close to these numbers (1) 417; (2) 568; (3) 714; (4) 897, (5) 932, (6) 1,030, and (7) 1,215. 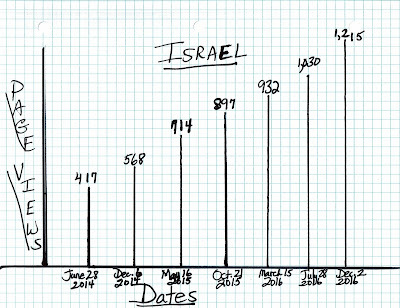 The newest development of page views from the country of Israel was on April 10, 2017, as I have been writing this particular posting for a while... an 8th occurrence of extreme high- about 131 days this time since the last on December 2, 2016, (the time getting even shorter between intervals of happening) there were 1,027 page views! I keep praying and thanking God! God cares about YOU, no matter what country you were born or reside! He knew you and planned you BEFORE the foundations of the Earth as the Creator of All! He wants you to be in Heaven with Him when that time comes. He want to guide you each day, have you for His own, love and protect you, and He needs YOUR help in spreading the Good News of Jesus Christ, the Gospel of the Bible. Bless you, Friend. As you can see by the graph above, God has seven times! blessed His chosen people, the Jewish nation of Israel, with His Message of the Promised One, the Messiah~~~ Jesus Christ of Nazareth! This happening is nothing short of astounding! No man or woman could do such a feat. Seven times, and now eight, within each particular day in a two-three hour period, God has enabled and encouraged hundreds of people living in Israel to read my humble blog...I do consider The Healing is Always Christ to be God's first ###(He led me Himself and with Christian friends and their prayer), and I am privileged to write it with His ideas and truths, his guidance, and of course His leading. As a child in grade school, God instilled in me the love of writing, and I am extremely thankful! I worried early on in this endeavor that I might run short of messages and themes. However, I learned very quickly that, naturally, our LORD God is fully capable of giving us what we need for the course/s on which He plans and send us to accomplish! He is the same yesterday, today and tomorrow; To Him, a thousand days is as one, and vice versa, and He knows what is happening everywhere with each one of us at the same time- and in the future. We do have free will, and we do pray for His unyielding Help! There are many amazing features, that can be seen, of this intentional work of the Holy Spirit with Israel. Each time it has occurred, as I said, it is within one day and within a two-three hour time period on that specific day. Every date the succeeding time and thereafter increases (slightly fewer with the most recent eighth- I am so grateful, no complaining)! Also, of great note is that the time periods- between each significantly high number- are shorter; they are decreasing. Therefore, at first, the days were 162 (5 months) in between each occurrence, and now they are 136 and lastly 131 (4.3 months). When I have shown other believers that the time is shortening between the increasingly higher page views from Israel, they believe that God is coming soon...and sooner! 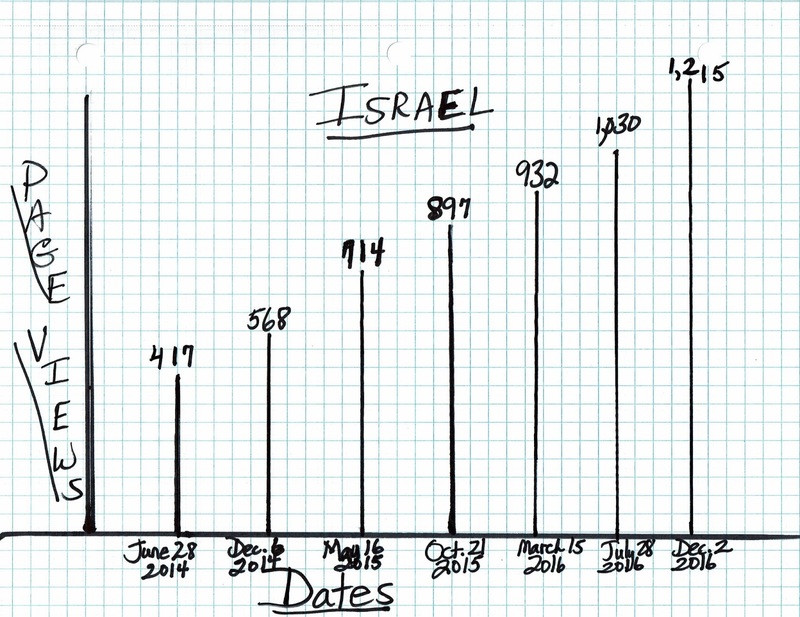 The last eight peaks are because of Israel's influx, including all of the people around the world who read here. THANK YOU. God's love and intention toward us is demonstrated so beautifully in the Gospel, the Good News of His Son, Jesus Christ, coming to Earth to be the Lamb of God and shed His blood for our sins so that we do not have to die and go to Hell- we are redeemed in Him, alone! Praise God for this GIFT of GOD in Christ Jesus. Jesus did the suffering and sacrifice so that you and I can be redeemed forever in His Salvation Gift to you and to me. He did this greatest act of Love for people who will accept Christ's Salvation, for those who need to re-commit to Him, and to encourage all Christians. God knows every nation certainly~~~ every part, grain, and pebble of land, the whole Earth, His vast skies and places. More to the point, He knows each of us- the ones He created- all about us: our likes and dislikes, our sighs and laughs, what we really think and do and dream. He knows our thoughts: the goodness that we think and do, as well as the bad or not-so-good in thought and action. He gives us free will to choose... He knows if we believe in His Son, Jesus Christ, and take Him as our personal LORD and Savior, then we are the redeemed and sanctified in God Almighty. You can do that now if you are not sure where you stand with God Almighty- Father, Son, and Holy Spirit. He wants you in His Kingdom now and forever. It actually begins the moment you accept Christ into your Life and as you go forward becoming more and more like Jesus in thought, word, and deed each day. Here is a Salvation Prayer that you may pray now and be certain that you are His forever and ever. He knows, and you will know, without question! Dear Heavenly Father, I want to accept Salvation and to be with You in Heaven when that day comes. I believe that Jesus died for me. He was and IS both completely Man and God. He took the pain and suffering for my sin, wrongdoings, missing the mark. The blameless Jesus, the Lamb of God, arose from the grave three days later. He walked amongst women and men, then 40 days later, arose to Heaven to sit at the right-hand of the Father, and so that the Holy Spirit of God could come to lead, guide and comfort here on Earth and to live within each believer's heart and mind at that moment we choose Christ, as now. When I die, I will be immediately present with you, LORD! Help me walk with You each day and to pass on the Gospel message to my family and others. Friend, you can pray this exact prayer- there are many- or say what is in your heart. It is all directly to God where Jesus is interceding for us! God bless and keep you for your decision for Christ Jesus. It will not all be easy, but you will have a peace in your life that others and you can see and feel. Each day, make the Way for me, Lord God. I love You so!!! ***Afterword...God Has Increasing Numbers> 3 Distinctive Times/Days for Extremely High Page Views from Israel in One Year: Two Exact, 162-Day Interims + Salvation Prayer!! Thank you, God is Real Today for this most lovely portrayal of Christ Jesus by Greg Olsen! In God We Trust, Donna M.